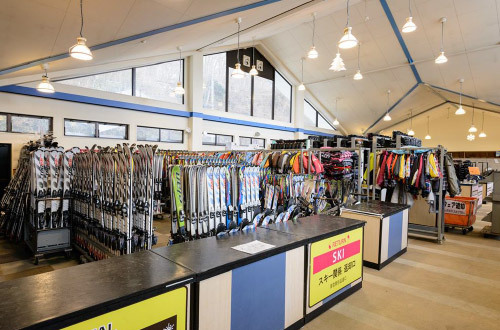 This shop has approximately 2,000 skis, 1,000 snowboards, and 700 clothing sets (tops and bottoms)! We are also getting new models all the time! We offer easy rental procedures and a wide variety of models for beginners. New clothing models are introduced each season, allowing you to have fun wearing fashionable items on the slopes. Purchase a Rental Ticket from the ticket machine in front of the reception desk and bring it to the rental window. * Boots are available in 0.5-centimeter increments from sizes 17 to 29 centimeters. * Rental gloves, goggles, and hats are not available. Please bring your own or purchase them in the shop. * Please be aware that you cannot choose the manufacturer or model for skis and snowboards. Over 1300 lockers are available in Fujiyama Snow Resort Yeti!